Roasted spaghetti squash gets tossed with herbs, garlic, and parmesan cheese. 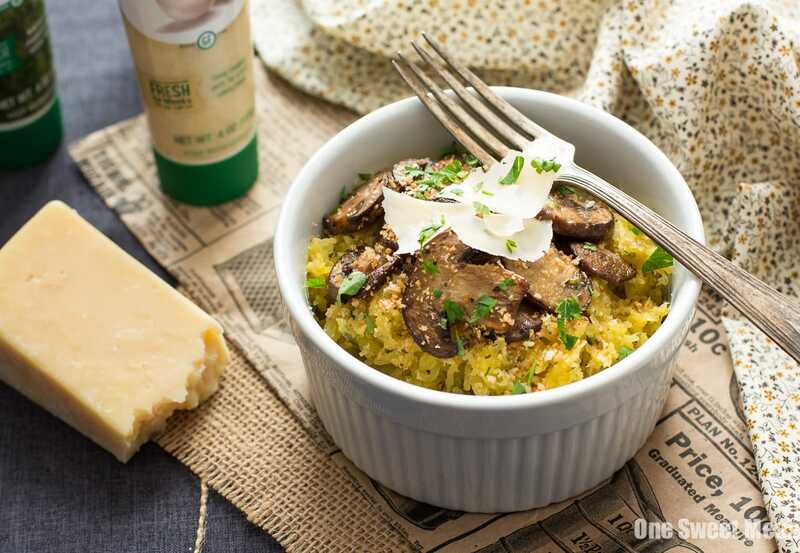 Just when you think this dish couldn’t get any better, crispy mushrooms and toasted bread crumbs get layered on top with fat shavings of parmesan cheese. I feel like I’m overloading you with side dishes. 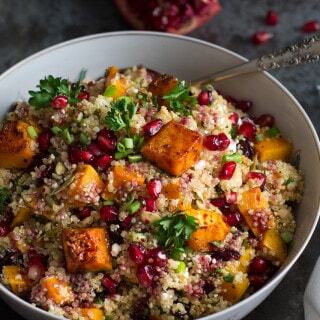 Between the Roasted Butternut Squash Quinoa Salad, Roasted Garlic Mashed Potatoes, and Cranberry-Walnut Sweet Potato Hash, you’d think I’d have my side dish fix. However, that is not the case. 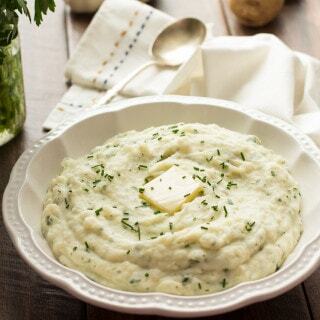 Like I mentioned last week, Thanksgiving is all about the side dishes–the more, the merrier. In an attempt to switch things up this year, I’ve decided to introduce some foreign dishes. Foreign as in never before tried. 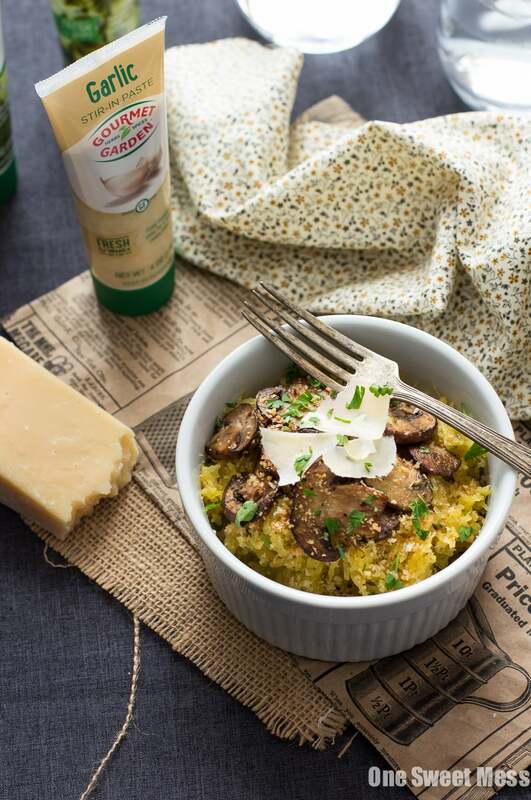 So, this year, I’ll gracing my table with this very delicious Garlic & Herb Spaghetti Squash with Mushrooms. No wonder he looks forward to his visits back home; I make him “exotic” food using ingredients like spaghetti squash. The good news is, he’ll be back for Thanksgiving. Being that it’s the middle of November, fresh herbs are no longer flourishing in my garden. Sure, I could go to the grocery store and purchase a bundle of basil and parsley, but they quickly wither away to a limp and wilted pile of death in my fridge. Instead of wasting money and having to wipe herb death juices from the bottom drawer of my fridge, I reach for Gourmet Garden. Their Stir-In-Paste Herb Tubes stay fresh for up to 3 months; although, I’ve had them last for up to six months. For this recipe, I used a combination of garlic, parsley, and basil. As always, cheese makes everything better, so I folded in a few tablespoons of Parmesan cheese. 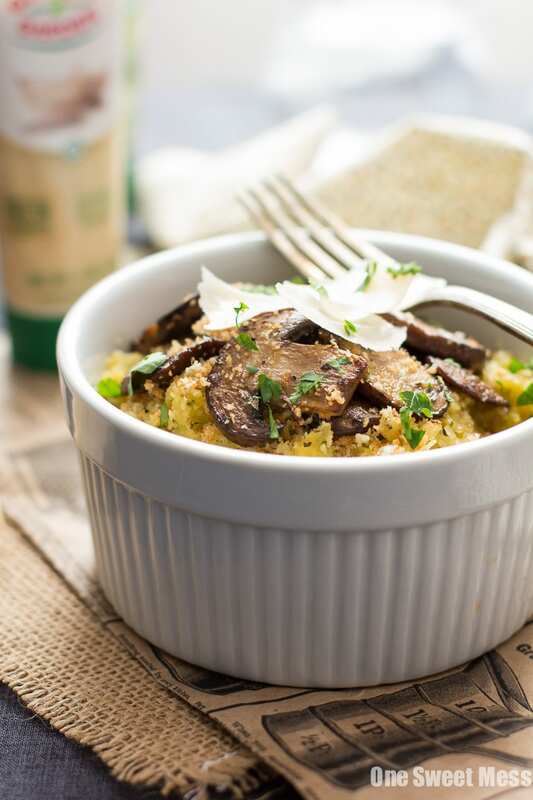 The crispy mushrooms and toasted panko bread crumbs add a bit of crunch. This is a dish your guests will request year after year. Slice the spaghetti squash in half and scoop out the seeds. 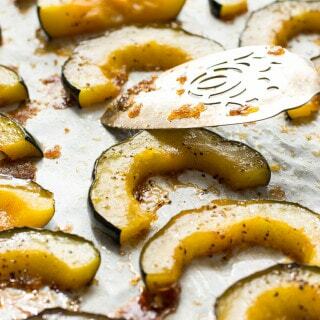 Place the squash halves on a baking sheet flesh side up. Drizzle each half with a 1/2 tablespoon of olive oil. Season each half with a generous pinch of salt and pepper. Bake for 20 minutes flesh side up. Using tongs, flip each half over and bake for 20 minutes, or until fork tender, flesh side down. While the spaghetti squash is baking, heat 2 tablespoons of olive oil in a large skillet over medium-high heat. Add the mushrooms to the pan and cook, stirring occasionally, until brown and slightly crispy. Refrain from salting until the very end. Transfer the mushrooms to a bowl; set aside. Turn the heat down to medium-low. Add the remaining 2 tablespoons of olive oil to the pan. Stir in the panko breadcrumbs. Cook, stirring often, until golden brown and toasted, about 4 minutes. Remove from the heat and set aside. When the spaghetti squash is finished roasting, scoop out each center using a fork. Transfer the squash strands to a large bowl. 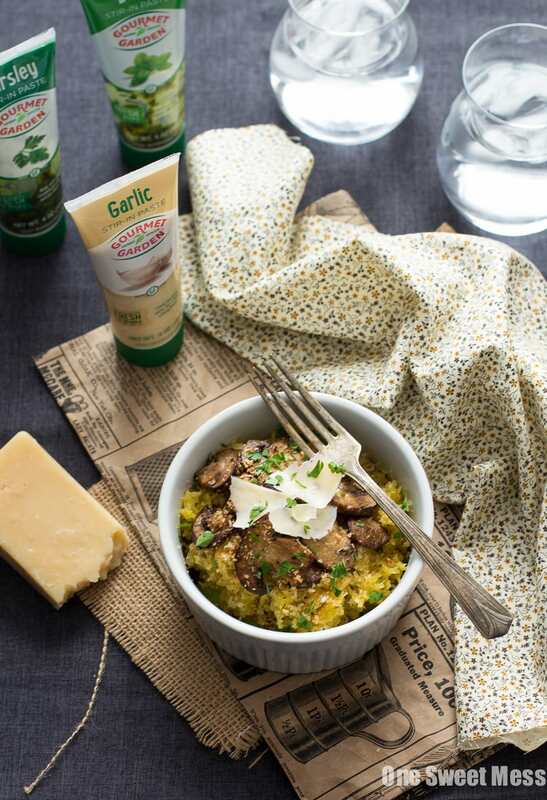 Stir in the garlic, herbs, and Parmesan cheese. Season with salt and pepper to taste. 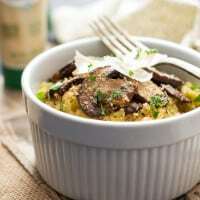 Transfer the mixture a serving dish and top with crispy mushrooms and toasted breadcrumbs. Sprinkle a few Parmesan shavings over the dish. Serve immediately or keep warm in a 200 degree F. oven until ready to serve. If you prefer to use fresh herbs, substitute 1 finely minced clove of garlic and 2 tablespoons each of chopped parsley and basil. Disclosure: This recipe was developed for the lovely folks at Gourmet Garden. All opinions are my own. Thank you for supporting my recipes and site while I work with brands I adore. Ahhhh this spaghetti squash looks like perfection! 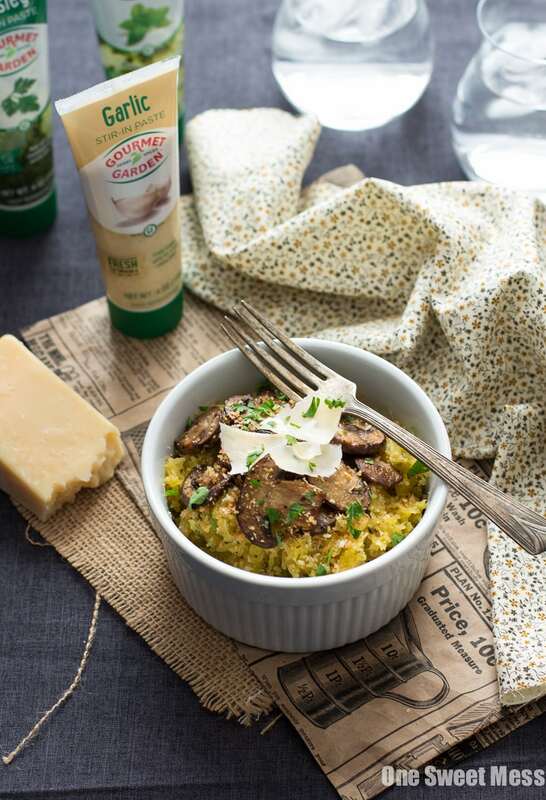 I’m always up for a garlic, herb, and mushroom infusion, and I was basically sold when you said “fat shavings of parmesan cheese.” Those stir-in pastes are definitely helpful – I love using the lemongrass one for Thai cooking, since lemongrass is such a beehive to prepare. Loving this dish, girl! Garlic, parmesan and spaghetti squash . . . sounds like a winner to me! I’ve gotten so into spaghetti squash these last few years! I would totally make a meal out of this!! This time of year I am all about the mushroomy comfort foods! I love that that has so much flavor from herbs too. 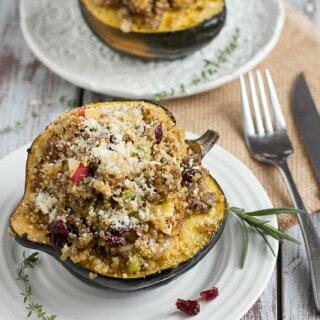 I really need to make spaghetti squash more and this is a great excuse! “Instead of wasting money and having to wipe herb death juices from the bottom drawer of my fridge” LOL I’m dying at this sentence, although it’s true! Mine die way too quickly as well, which is why I go through so much Gourmet Garden pastes (especially basil, cilantro, and garlic). My family is the same way. Anything “exotic” and they are scared to try it. I don’t think I’ve cooked them spaghetti squash before, so I’ll have to try this side dish out on them. You can feed me “exotic” spaghetti squash anytime. It’s one of my favorites! I had to laugh at the story of your grandfather and the quiche. My relatives are much the same way. In fact, on Mother’s Day, when I make quiche, I have to tell my uncle “it’s just egg pie.” LOL. This recipe is reminding me that I haven’t made any spaghetti squash this year. It’s high time I remedy that, because this sounds absolutely amazing, Jennie! I can’t even tell you how much of the Gourmet Garden garlic I go through – it’s a sickness, really. I love how convenient it is! 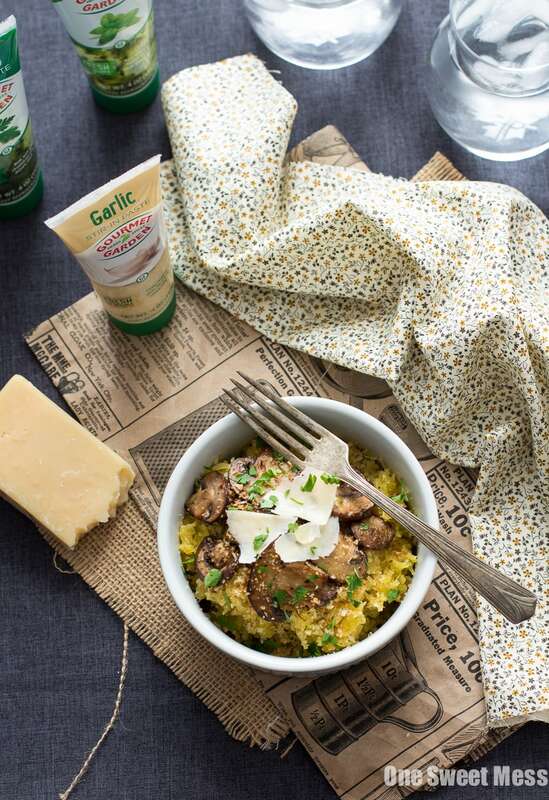 I have a spaghetti squash sitting on my counter right now, so I think this recipe needs to happen this weekend. I never make spaghetti squash because I never know what to do with it. However I love this! The herbs and the mushrooms are the perfect compliment. I need to add this to my dinner rotation soon. How come you said to wait on salting your mushrooms? First time I’ve ever seen that! In order for mushrooms to brown properly, the salting process has to wait until the end. Salting the mushrooms at the beginning will cause them to release too much liquid. Rather than brown, they’ll steam.